free climbing cliffs above the ocean – when sitting on the beach and drinking wine became boring. old pics 122, originally uploaded by Mic2006. 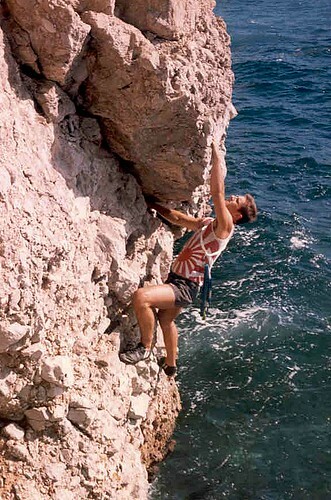 “Here I am one sunny afternoon climbing the cliffs at the edge of Camp Bay in Gibraltar. The peninsula is a 6 kilometer long block of Jurassic age limestone, faced at it’s north end by massive cliffs – rising to around 1200 feet above the ocean level runway of the airport. Cliffs also skirt much of the southern edge of the rock where it meets the ocean. This was an especially popular spot (Camp Bay) for easy little climbs and for cliff jumping. The ocean was generally deep enough to handle a falling human body and the rocks – stable enough for climbing. On some days when there were large waves it was important to time your jumps to coincide with the the inwash of the swell. This prevented a cliffside battering and 5 or 6 feet less water than you were expecting. I only misjudged the swell once and on a nearby beach I had to surgically remove a rounded pebble from my palm with a can opener. There is a spectacular path that runs along Gibraltar’s eastern face and in following it you will wander through a unique cliffside ecosystem and be in close proximity to the wildlife and unusual vegetation of the region. There are many unique plant and animal species that grow on Gibraltar’s cliffs and the climber has to be especially wary. At Little Bay scientists have found the only known occurance of the plant species – “Aeonium Haworthii” outside of the Canary Islands. They speculate that the tiny seed was likely carried there on the eastward blowing winds. Bats inhabit the many cliffside caves and at Gorham’s Cave – an impressive water-level sea cave – archeologists have found evidence of the last known colony of Neanderthals. The Neanderthal was a stocky hunter of the European plains and with the spread of modern man into his domain he all but disappeared around 30 000 years ago. The Gibraltan Neanderthals survived on this isolated peninsula for at least 2000 years longer than was previously suspected. Rife with history and spectacular vistas a visit to Gibraltar and its amazing cliffs is a worthy travel venture”.